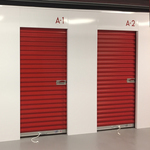 Small/Medium sized air-conditioned secure storage for household items or office fixtures. It accommodates furnishings of a mid-sized bedroom, including a queen-sized bed, a dresser, a TV, and several small to medium-sized boxes. 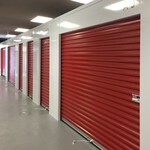 Medium sized air-conditioned secure storage for household items or office fixtures. It accommodates furnishings of a mid-sized bedroom, including a queen-sized bed, a dresser, a TV and several small to medium-sized boxes. 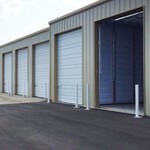 Medium sized air-conditioned secure storage for household items or office fixtures. It accommodates the contents of an entire family room or two full bedrooms, including several small to medium-sized boxes. Large air-conditioned and heated secure storage for household items or office fixtures. It accommodates the contents of a multi-bedroom house, including several oversized items like a couch, a refrigerator, a washer/dryer, and a dining room set or several large boxes. Large garage sized warehouse storage to accommodate a boat, RV or the contents of a multi-bedroom house with major appliances, garage extras, boxes, and miscellaneous items or business files and inventory. Large secure storage warehouse for household items, possibly small boat or vehicle. It accommodates the contents of a multi-bedroom house, including several oversized items like a couch, a refrigerator, a washer/dryer, and a dining room set or several large boxes. Very Spacious. Available space for outdoor parking. Area surrounded by high fencing, lighted area for night time access, 24 hour camera surveillance, and 24 hour access to tenant. 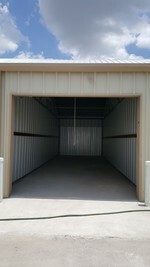 X-tra large garage sized warehouse storage to accommodate a boat, RV or the contents of a multi-bedroom house with major appliances, garage extras, boxes, and miscellaneous items or business files and inventory.